A new paper suggests, contrary to claims of global warming alarmists that the Amazon will dry up, that the Amazon has become wetter over the past 100 years of slight global warming [0.7C]. The study finds an "intensification of the hydrological cycle" in the Amazon, which indicates an increase in precipitation. The authors note, "Climate models vary widely in their predictions for the Amazon, and we still do not know whether the Amazon will become wetter or dryer in a warmer world." Because of its vast size and location along the equator, the response of the hydrological cycle of the Amazon basin to climate change may significantly affect the magnitude and speed of climate change for the entire globe. It is therefore important to gain a better understanding of its hydrological cycle. Tree rings go with the flow of the Amazon University of Leeds-led research has used tree rings from eight cedar trees in Bolivia to unlock a 100-year history of rainfall across the Amazon basin, which contains the world's largest river system. The new study shows that the rings in lowland tropical cedar trees provide a natural archive of data closely related to historic rainfall. Researchers measured the amounts of two different oxygen isotopes trapped in the wood's rings: oxygen-16 and the heavier oxygen-18. By looking at the varying amounts of the two isotopes, they could see how the pattern of rainfall changed year by year. This allowed them to see how much it rained over the Amazon basin over the past century. The lead author of the study, Dr Roel Brienen from the School of Geography at the University of Leeds, said: "We already knew that some tropical tree species form annual rings and we also anticipated that the isotopic signature in these rings might record changes in the climate. 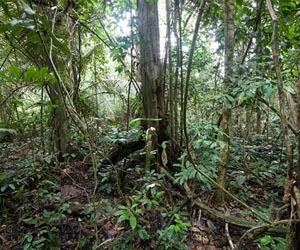 "What surprised us, however, is that just eight trees from one single site actually tell us how much it rained not just at that site but over the entire Amazon catchment. That is an area about 25 times the size of the UK. The isotope values recorded in tree rings were very closely related to annual variation in the river levels of the Amazon, and thus of the amount of rainfall that flows into the ocean." The Amazon basin is among the richest natural ecosystems in the world, containing about one tenth of the planet's biodiversity and one fifth of the carbon stored in plant biomass. It is also among the wettest places in the world; about one fifth of the global land precipitation falls in the Amazon basin and drains into the Atlantic Ocean through the world's biggest river. Co-author Dr Manuel Gloor, also at the University of Leeds, said: "Climate models vary widely in their predictions for the Amazon, and we still do not know whether the Amazon will become wetter or dryer in a warmer world. We discovered a very powerful tool to look back into the past, which allows us to better understand the magnitude of natural variability of the system." "In a similar way that annual layers in polar ice sheets have been used to study past temperatures, we are now able to use tree rings of this species as a natural archive for precipitation over the Amazon basin. If we find older trees with similar signal strength then this will greatly help us to advance our knowledge of the system." Dr Brienen added: "The record is so sensitive that simply from the isotope values we can say which year we are looking at. For example, the extreme El Nino year of 1925-26 which caused very low river levels, clearly stands out in the record." Although the century-long record provided by the trees is relatively short, some interesting trends are evident. "The oxygen isotope series shows an increase over time, which may be due to an intensification of the hydrological cycle," said Dr Gloor. "That could also explain the observed long-term trend in river discharge. We need however to replicate this research at different places in the Amazon to really be able to say more." The research is a collaboration between the University of Leeds, the Helmholtz Centre Potsdam (Germany), University of Utrecht and the Institut de Recherche pour le Developpement (IRD, Peru). The paper is published online in the journal Proceedings of National Academy of Sciences.